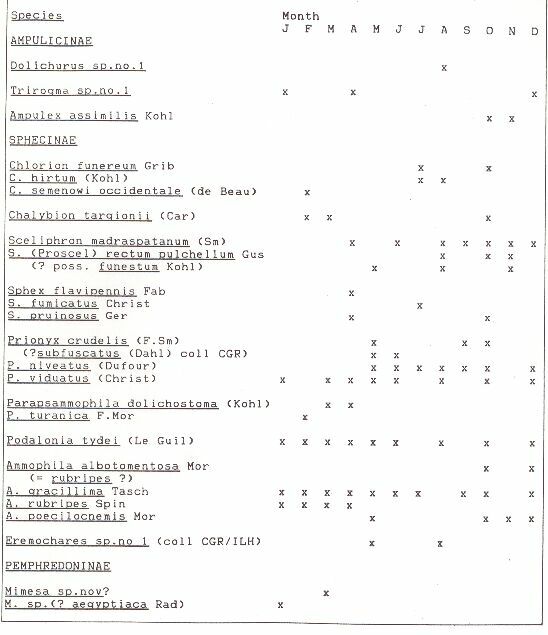 This is the second part of a series of several articles giving a detailed systematic list of the bees and wasps collected in the U.A.E. The period covered for this super-family is 1981 to mid-1986. 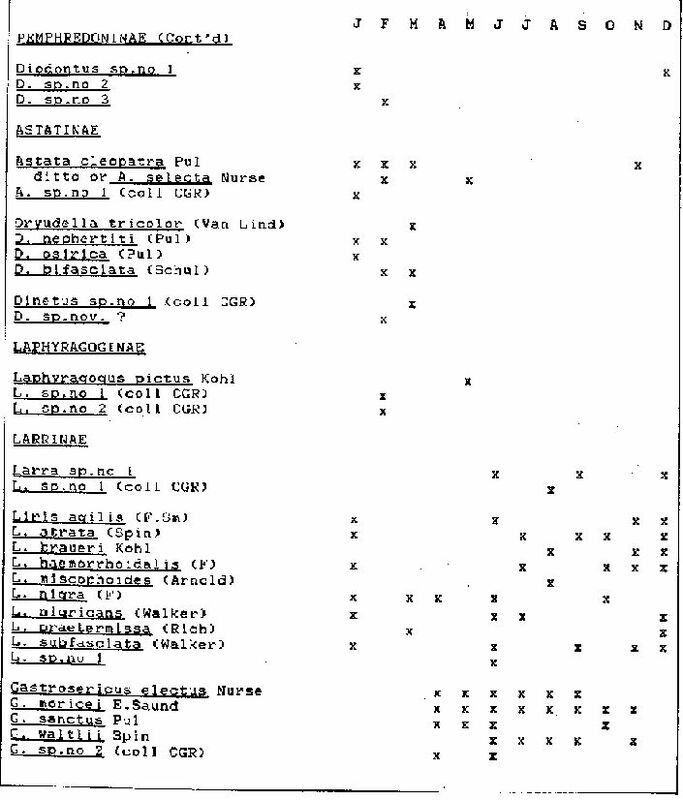 The following listing takes the form of a flight table and includes a comprehensive schedule of the Sphecoidea taken since the collection of the Hymenoptera Aculeata commenced in 1981. I am indebted to Giles Roche who initially put this specialised section of Natural History on a very sound footing in the UAE and who has recently sent me a complete list of his Sphecid captures collected during his tenure in the Emirates. 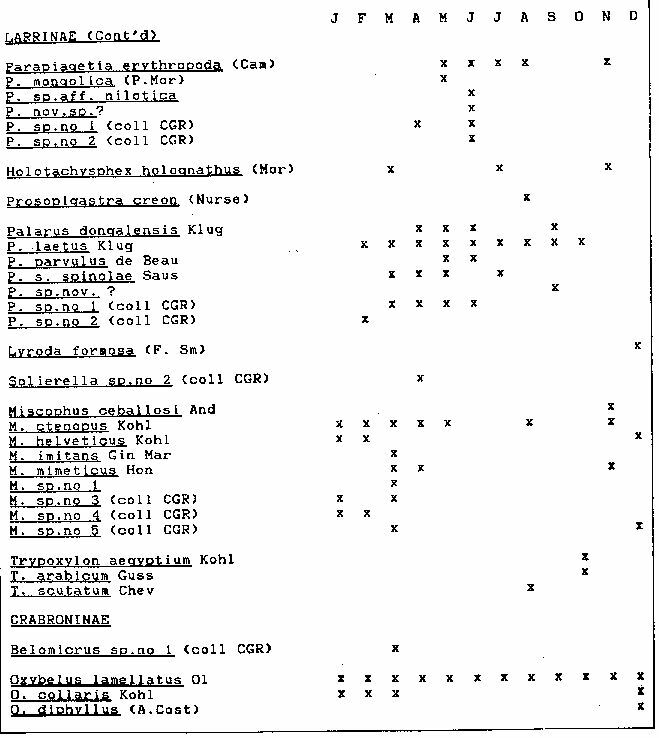 In order to maintain a relatively concise format I have not attempted to give any indication of the localities of capture in the attached tables. However, as the inclusion of such information is of importance in any such report it will form the subject of a future article. 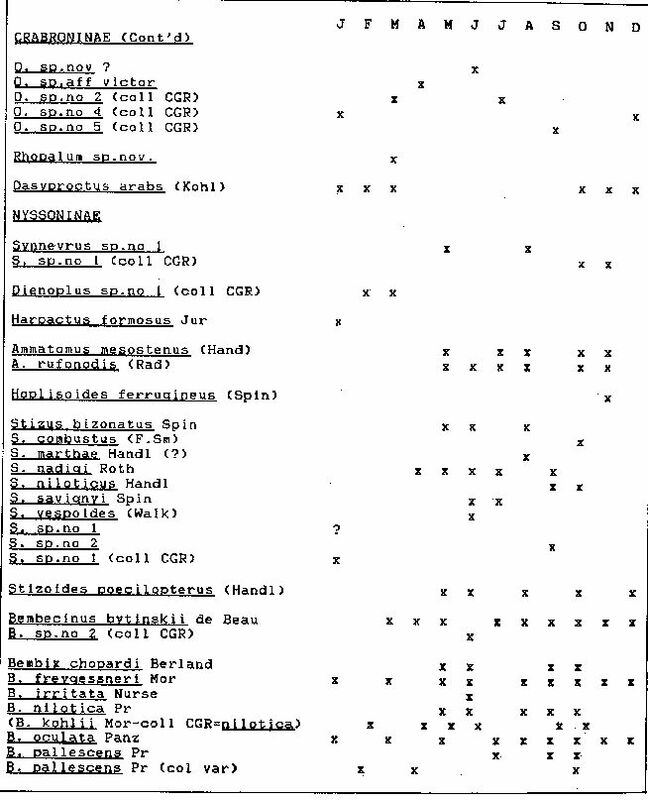 Unidentified specimens have been allocated a species number following the generic name (e.g. Trirogma sp. no. 1) and possible new species have been described as such (i.e."sp. nov."). 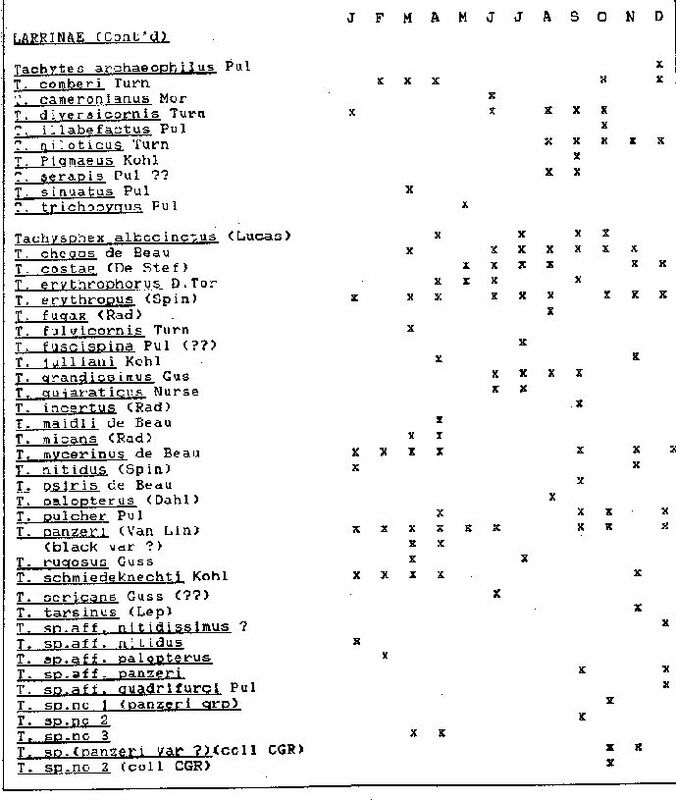 Numbers given are those allocated to specimens in my own collection unless otherwise noted as relating to those of C.G. Roche (i.e. "coll. CGR"). Where determinations of my material have been revised or updated and where Giles has used the original nomenclature, or where conflicts in identification are suspected, I have indicated this as appropriate (e.g. Prionyx crudelis). Due to the difficulties with identification, it is possible that numbered species contained in CGR's collection are also named in my collection and vice versa. However, it must be stated that it may be a considerable time before all individuals are satisfactorily identified. Some of the recordings are of extreme interest and both Dolichurus and Rhopalurn are genera new to the Arabian peninsula. It is also believed that the Sceliphron (Proscel.) is also a sub-genus new to Arabia. This article is solely dedicated to the Sphecid (fossorial or digging) wasps of the U.A.E. and I would like to give my sincere thanks to Mr.Ken Guichard for identifying virtually all my material over the previous months and without whom this article would not have been possible. S. sp. no 1 ?